When the noise began to run that old worn out batteries could slow down the iPhone, I immediately thought of my spouse’s iPhone 6s Plus. She’s been using this phone for over a year – after a year in my hands – and she’s been complaining about performance issues for a few weeks. It’s not iOS 11 that has reduced the speed of execution, it has never suffered from the famous keyboard bug, for example, iPhone 6s Plus apps worked normally, just like the system … until it was not more the case. In particular, she frequently complained of slowdowns in animations, blockages (or freezes) that do not last for a second but can be particularly annoying, especially if they are everywhere. I could see that they were indeed very present, if only by opening the Settings: scrolling lists was almost blocked each time we opened a new topic. Before hearing about a link to the battery, I thought iOS 11 was responsible and I was hoping that an update would correct the problem. This new explanation seemed rather credible in the case of this iPhone 6s Plus, where the battery had never been changed since the acquisition of the phone in September 2015 and the device had served a lot. It was close to 600 cycles for this iPhone 6s Plus (a full discharge and charge) and was probably not in good condition. Moreover, the user also complained of having to recharge the phone several times a day and she always had an external battery with her on leaving. Replacing the battery was something I was planning to do in the medium term and if it could also fix the performance problem, iPhone 6s Plus was even better. So I booked an appointment at the Genius Bar of the Apple Store corner to exchange the battery of the iPhone 6s Plus. I knew that the transaction was charged 89 € for a phone out of warranty. It is more expensive than in the shops that are found everywhere, but it is the assurance of a job perfectly done and to keep an official battery in the device. The new battery installed by Apple for my iPhone 6s Plus is also guaranteed 1 year, an advantage that few third parties offer. What I did not know when I made the appointment was that I would have to fight for Apple to accept my 90 € and replace the battery. “Beat,” the word is strong, but the official policy is to replace only defective batteries and not those that are simply worn out by time and use. And Apple has a very precise definition of abnormal wear and support: the battery must reach 80% of its capacity after 500 cycles. This measurement is done in relation to the theoretical capacity to manufacture the iPhone. In the case of the iPhone 6s Plus, the battery has a capacity of 2 915 mAh: when you fully charge the iPhone 6s Plus, you have this electric charge available. Over time, the theoretical capacity decreases. This is perfectly normal, it is related to the components that are used to create the batteries and Apple must also comply, for lack of (yet?) Found a reliable way to circumvent the fundamental rules of physics and the chemistry. In short, a battery wears over time and it’s normal. Unless it wears out faster than what was intended for its design, which is then a sign of abnormal premature wear. Apple puts the slider at 80% capacity loss for 500 cycles, which in my case means that the iPhone 6s Plus battery must have reached a capacity of 2,332 mAh or less. I tried to know if the iPhone 6s Plus used by my spouse was in this category before the appointment, but there is no reliable way to do it. At most, you can know the number of cycles and if the battery is defective, in the sense that there is a problem that requires a replacement as soon as possible. I knew that the number of cycles was higher than Apple’s criteria, but that’s about it. Apple, fortunately, has more reliable tools to measure this information. 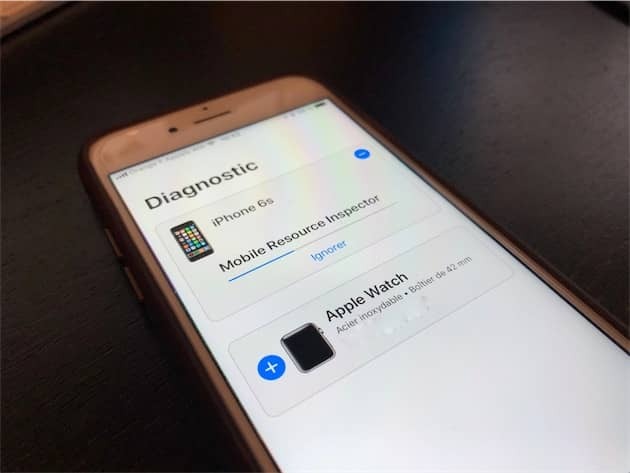 Whether you go to the Genius Bar of an Apple Store or call the AppleCare service, you will always have a complete remote diagnosis. 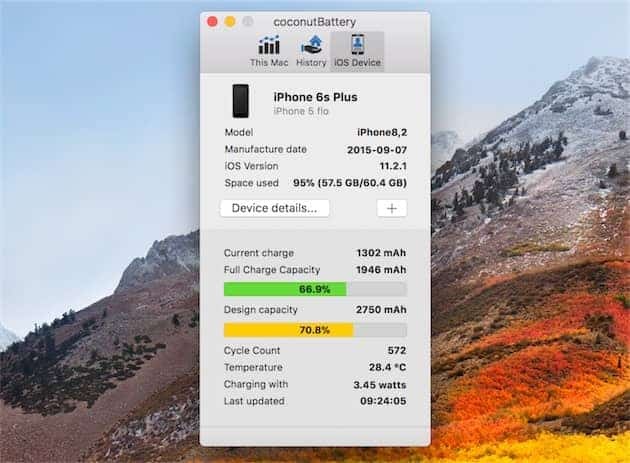 This tool goes back much information on an iPhone 6s Plus and in particular a complete profile of the battery. This profile generated during the diagnosis determines if the battery is in bad condition, or if it has been used prematurely. In general, the instruction is to propose a replacement if the remaining capacity has fallen below the 80% of remaining capacity. The replacement will be free if the device is under warranty or if you have an AppleCare + contract and the report is made before the end of the contract. Otherwise, it will cost 89 €. Until then, it’s easy, but the situation is complicated if the diagnostic tool establishes that the battery has not fallen below the 80% of remaining capacity. In this case, Apple Store employees and those you have on the phone are instructed not to propose the replacement of the battery, even if the customer is willing to pay the amount requested and claims. That’s what happened to me. 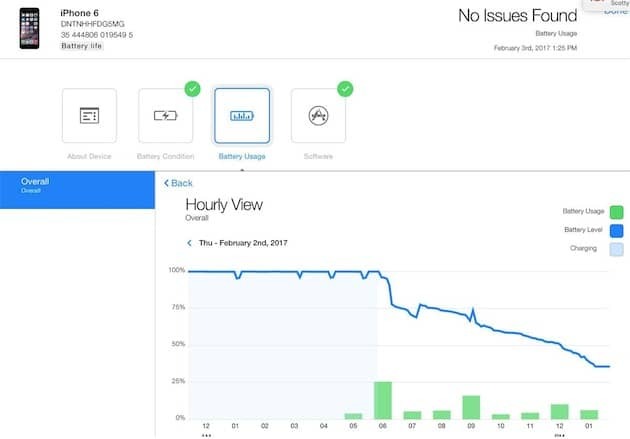 The battery of the iPhone 6s Plus brought to the Apple Store has been diagnosed with a capacity of 85%, not far from the limit so, but still in the green on the graph produced by the tool. This graph contains three distinct areas: a green indicating that everything is fine, a yellow for worn out batteries and a red for defective batteries. 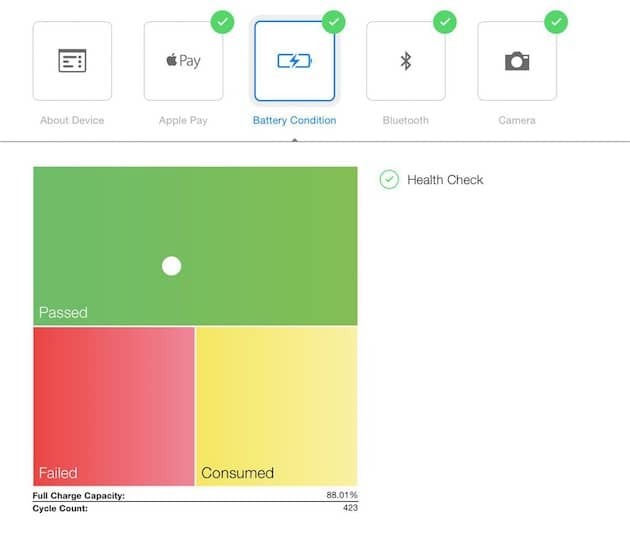 One point represents the state of the iOS device inspected and in my case, this point was in the green, even if it was not very far from the yellow, acknowledged the Apple specialist. Being above 80%, but not much above, I was in a gray area where Apple does not necessarily refuse the exchange but where a deposit is given to check if there is not another explanation to my problems. Basically, my interlocutor was prompted to check if there was another reason for slowness problems that I mentioned, rather than replacing the battery. It was the order, but it was even more motivated that he had obviously not heard of the controversy and even less of the official response from Apple the night before. the Genius Bar are already crowded, Apple prefers to concentrate its efforts on urgent cases and the manufacturer does not want to change the batteries for reasons of “comfort”. All these reasons are valid in itself, even if we can retort that the congested Apple Store is not the problem of the customer and that any repair shop willingly accepts to change a battery without worrying the least recycling of the old. Although I must admit that I was surprised at this policy initially, I am now convinced that it makes sense, but that more room should be allowed for cases like mine. Even though the person who took care of me at the Genius Bar had the best intentions in the world, the conversation went from whether the battery really was the cause of the problems to a detailed and sometimes misplaced analysis of the actual use of the iPhone. I got all the urban myths, apps to close in the multitasking interface to improve performance at the small one hour recharges that would be bad for the battery, and I felt like scrutinized and even criticized for my request. I’m not trying to overwhelm a particular person, but this exchange a little tedious Apple Store underlines that there is a problem currently. Apple has come under pressure from the media and probably from its customers to recognize that performance was deliberately limited to preserve aging batteries. 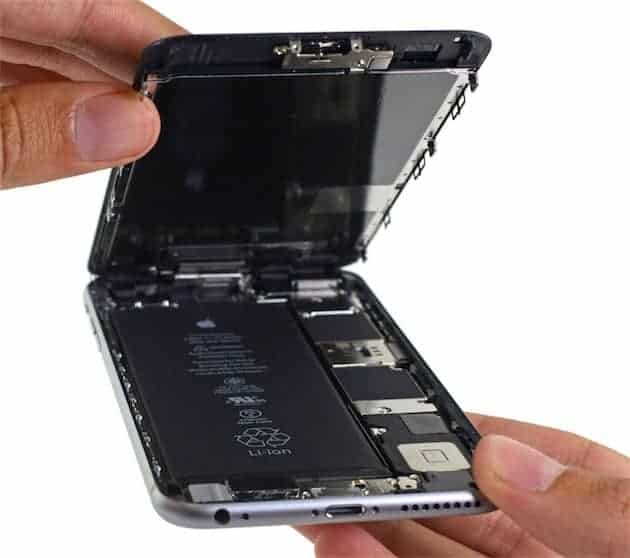 But at the same time, the manufacturer always instructs his teams not to replace the batteries of the iPhone 6s Plus, except when it is absolutely necessary. I hope that the instructions will change and that cases like mine will be dealt with more quickly and easily. Because yes, change the battery of this iPhone 6s Plus had the desired effect. 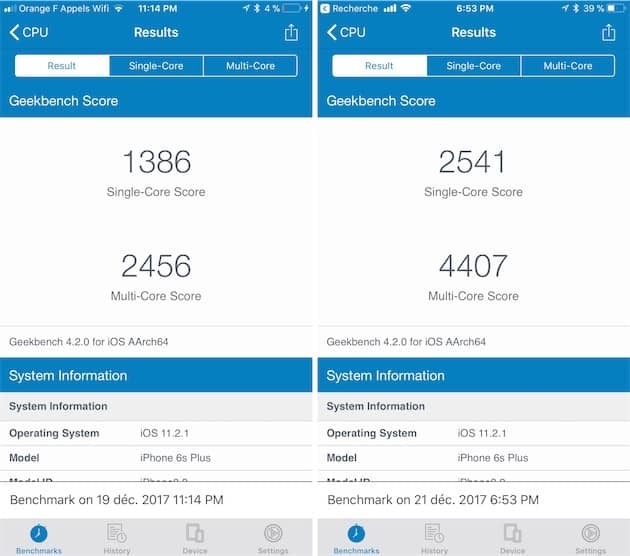 Before taking the iPhone 6s Plus to the Apple Store, I evaluated its theoretical performance by performing a measurement with Geekbench, our reference tool for testing. The score was quite low: less than 1,400 points in single-core, just 2,500 points in multi-core. After the change of battery, I repeated the same test and the scores were better, to a point that I did not imagine: more than 2,500 single-core, about 4,400 in multi. On this iPhone 6s Plus, the simple fact of changing the battery has improved the theoretical performance dramatically. A gain of about 80% against 90 €? I think it’s a great deal! And the theoretical tests are good, but the impact is also present in the use. It’s been around 24 hours at the time I write these lines since he recovered an iPhone with a new battery and the main user is delighted. 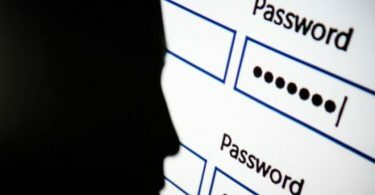 He did not notice any blocking of the interface, especially in Messages which often posed a problem before. It is naturally very subjective, but he has the feeling to have found a phone like new, at least with performances at the level of those he had six months or a year ago. My example is far from isolated, many of you have testified in the comments to report very clear performance gains by changing a battery. Very disappointed with the loss of responsiveness of my iPhone 6 two years after the transition to iOS 11, I went to the first workshop in the neighborhood to replace the battery as soon as the first news have blossomed on the net about it. I have not done any performance tests and it is not a panacea yet, but there is some progress that is very visible. The most obvious is the launch of CarPlay in my car where the first call to Siri could be endless. It is now completely correct. It should nevertheless be noted that not everyone has made this observation. 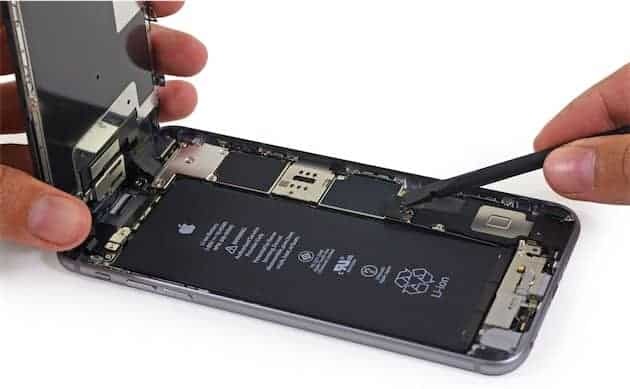 Some readers have changed the battery of their iPhone and found no difference, which probably means that it was, indeed, not the cause of the problem. That’s why Apple is right to ask its employees to check if there are no other causes than the battery if there is a problem. And if a battery is in perfect condition, the manufacturer is also right to refuse a replacement, even if a customer requests it. However, now that we know that performance is effectively reduced when a battery starts to weaken, it should also relax the rules and agree to install new batteries for this reason. In addition, Apple would probably benefit from giving more information to its users. The battery section of the iOS settings warns when the battery needs to be replaced when it is in the red area of the diagnosis, but that’s not enough anymore. At a minimum, there should be a notification somewhere when the system starts to be shut down to preserve the battery. And why not take the tools reserved for the Apple Store to integrate them in one form another? They are complete while remaining simple to understand and they are very educational for those interested in the subject. To conclude, if you use a two or three-year-old iPhone and you find its performance poor, do not hesitate to ask Apple to make a diagnosis. You can do it in an Apple Store or by calling AppleCare, in both cases and it will be free and you will at least have an idea of the state of the battery. If you are asked to change the battery for iPhone 6s Plus, you can then decide if the 89 € requested is justified. 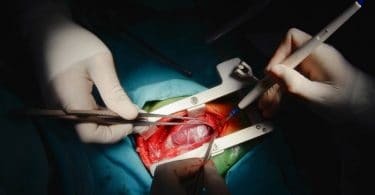 I can not guarantee that performance will be improved for sure after the operation. I can simply bring my testimony and that of several readers: changing the battery has indeed boosted performance. What extends the life of an iPhone 6s Plus, at least until the next generation, which is significant.